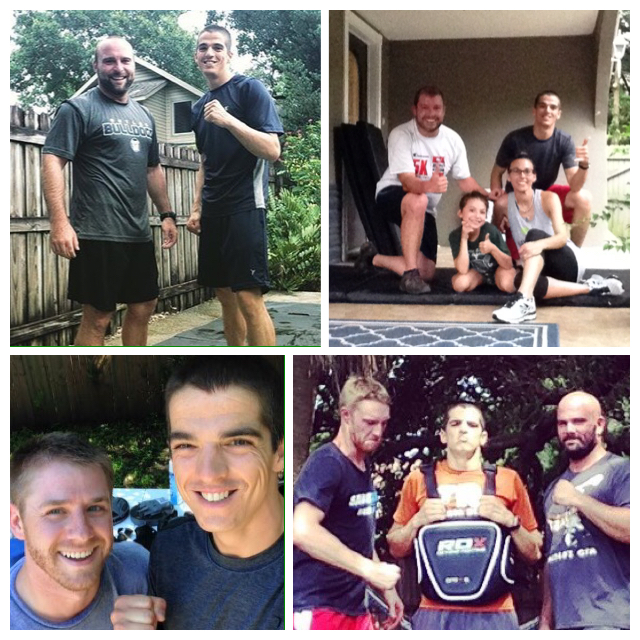 It has been a little over 3 months since I started offering individualized ETT personal training sessions. During that time I’ve done a lot of “on the job” training in order to meet the specific needs of each client. I’m constantly looking for feedback from my clients to ensure that I am providing them the training that they desire. 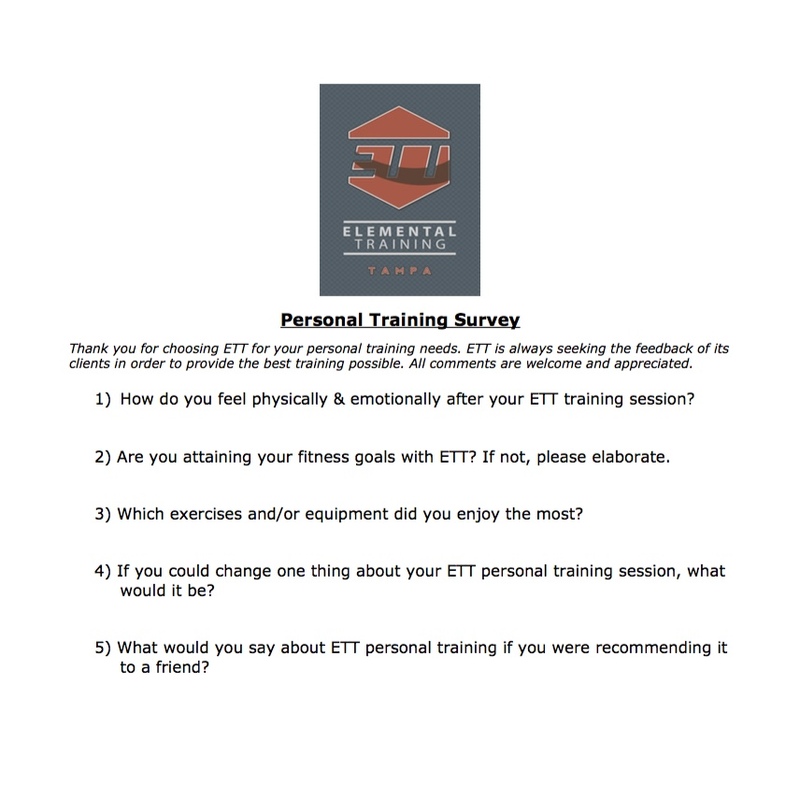 I recently had 2 clients complete their ETT personal training packages, and ask if they would fill out a survey about their experience training with ETT. I have to admit I love reading survey answers like “I have worked with personal trainers in the past and Nick is easily the best. He is attentive, encouraging, and receptive to feedback.” As good as those comments make me feel about the ETT training system I think I appreciate the constructive suggestions more. One of the clients suggested that I work on “smoother/faster transitions between segments in the program.” I am a stickler on proper technique which leads to me giving very detailed instructions so I’m sure I can get a little long winded. I will definitely work on streamlining my instructions in order to help move the workout along and keep the client’s heart rate at the optimum BPM for exercise. Another suggestion that one of the clients made was that they “prefer not to workout after sitting in traffic for 45 minutes after work.” I totally understand how unmotivated a person can be to exercise after putting in at least 8 hours at work then sitting in rush hour traffic. I think it is pivotal for me to recognize which clients need motivation whether it be through text messages or posts on ETT’s social media pages. In addition to motivation, the last suggestion brings up another aspect of ETT personal training that I hope to address in the near future. Due to my non-fitness related work schedule, the vast majority of my personal training sessions occur weekdays after 4pm. I realize that the limited schedule is an issue I will have to address if ETT is to evolve from its current state. My hope is that one day, through the knowledge I gather from certification classes and the “hands on” experience I gain during ETT personal training sessions, I will be able to convert Elemental Training Tampa from a part-time passion project into a full-time labor of love. 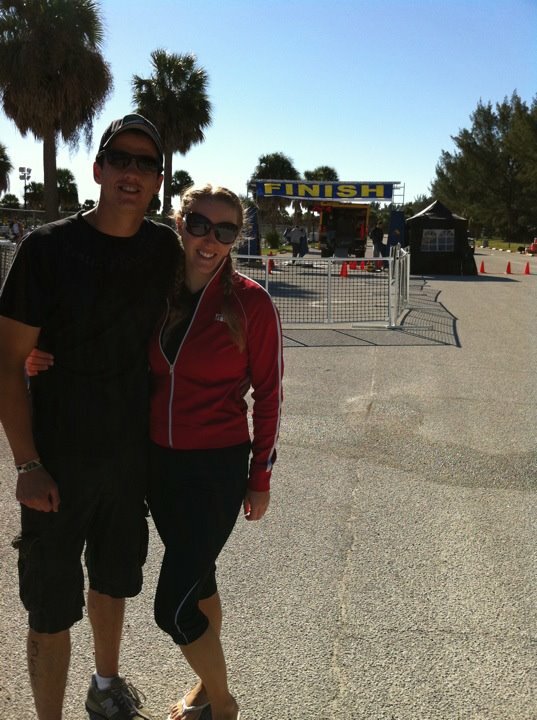 This week’s Throwback Thursday pic is Shannon and I after completing the Escape from Ft. De Soto Sprint Triathlon back in 2011. I had completed several sprint triathlons before but this was Shannon’s first triathlon and she did awesome. Triathlons can be somewhat daunting for first-timers, but Shannon attacked it like a seasoned pro. I highly recommend this particular race to anyone who lives in the Tampa Bay Area and is looking to get into triathlons. I also recommend checking out Shannon’s blog. You will notice that she is a little more eloquent than I am.